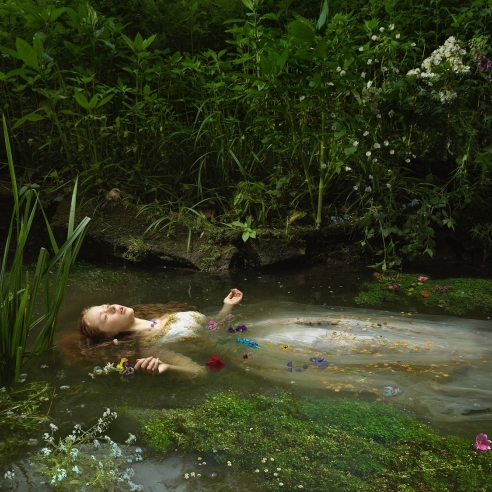 Julia Fullerton-Batten: A Testament to Love is the artist’s third solo exhibition with Jenkins Johnson Gallery, and features the artist’s new series, A Testament to Love. Building on her earlier series that investigate the psyches and relationships of teenage girls, her new series narrates the life struggles when love goes wrong. The women in the images wrestle with the eternal search for a happy ending but find themselves left with feelings of solitude, loneliness, fear, regret, and resignation. Fullerton-Batten focuses on the moments just before or just after the climax of the scenario, which are laden with emotion and tension, leaving the viewer with more questions than answers. Inspired by Hollywood films of the 1960s and 1970s, as well as by the iconic works of Edward Hopper, each image is constructed for its cinematic effects—hard lighting and atmospheric skies heighten the drama. While there is focus on the women’s inner anxieties and despair, they are not passive recipients of life’s drama but an integral part with their own important roles to play; they are empowered. The viewer decides the story—is she being followed or following? Is she leaving or has she been left? Fullerton-Batten has received much critical acclaim and has been featured in the New Yorker, Le Monde, and the Financial Times, among others. Her work was the cover image for Thames & Hudson’s 2009 book A Guide to Collecting Contemporary Photography. She has shown at esteemed international institutions such as Centre Pompidou, Paris; Museum of Contemporary Art, Shanghai; Museo Thyssen-Bornemisza, Madrid; and a solo exhibition at the National Portrait Gallery in London. Opening in February, her work is featured at the Swedish Museum of Photography. Born in Germany, Fullerton-Batten lives and works in London.